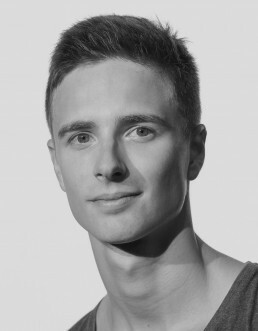 Belgian Born, Jan Casier is a Soloist dancer with Ballett Zürich and trained with the Royal Ballet School of Antwerp. Throughout his career Jan has also been a member of the Royal Ballet of Flanders and a Coryphee with the Semperoper Ballett Dresden. He made a guest appearance with David Dawson’s Faun (e) with the English National Ballet and has appeared in several international ballet galas such as the 2015 International Ballet Star Gala in Taipei and Les Hivernales de la Danse in Belgium.His repertoire includes roles such as Lensky in Oneigin (John Cranko), The Sugar Plum Cavalier in The Nutcracker (Aaron S. Watkin/Jason Beechey after Marius Petipa), In the middle somewhat elevated, Impressing the Czar, Artifact and Quintett (William Forsythe), Leonce in Leonce and Lena, Paris in Romeo and Juliet and the title role in Woyzeck (Christian Spuck). Additionally, throughout his career he has been involved in numerous creations and Principal/Soloist roles in works by Kenneth Mac Millan, George Balanchine, Alexei Ratmansky, Jiří Kylián, David Dawson, Wayne McGregor, Sol León/Paul Lightfoot, Hans Van Mahnen, Edward Clug, Stijn Celis, Jacopo Godani, Alexander Ekman and Marco Goecke.